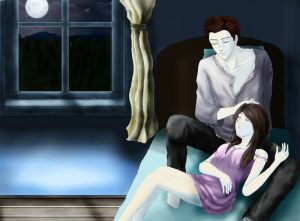 My character is Edward Cullen and this is how I think he feels when he watches Bella asleep. What is she dreaming? Is it me? I hate not being able to see into her mind. Piercing her soul would make the thirst for her blood less unbearable. The scent, that sweet scent that resembled a warm, moist summer day. And well thats my little role playing game. Whats yours?